Your upcoming wedding is not a one-size-fits-all event - your love story and your sense of style is unique. So why settle for hum-drum wedding invitations when you can go big, bold and elegant? Weddingstar has searched high and low for amazing wedding invitation designs from all over the world - you are sure to find the laser-cut wedding invitations and quality embossed wedding invitations that best reflect your sense of style and unique eye for detail.Find what you're looking for with our ultimate selection of elegantly embossed and laser-cut wedding invitation cards. You don't have to skimp on style when you are saving big money - these premium quality invitations are both amazing to look at and won't break your budget.Browse our amazing selection for ideas and inspiration for your upcoming wedding. 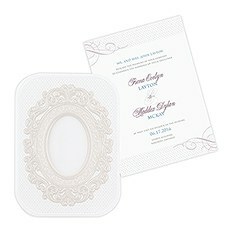 Let our intricate laser-cut wedding invitation designs woo you with their premium detailed refinement and beauty. Choose from the sweetly serene wilderness scene of our Woodland Pretty Laser Embossed invitation that displays a lovely forest scene with wildlife, birch trees and embossed tree bark details. Let the gorgeously elaborate laser cutting of our Art Deco Laser Embossed Invitation take you back to the classic elegance of Art Deco beauty, distinct lines and sophisticated style. Laser-cut scrolling, floral designs, lace and more will clearly demonstrate that you have an attention to detail that is second to none!Opt for our embossed wedding invitations styles. You will be surprised when you see what a difference embossing makes and how much it adds to personalised wedding invitation's style.A little overwhelmed about the styles and designs? Torn between several styles and need input from family and friends? Weddingstar makes it easy for you to choose the perfect wedding invitation. Simply create your design and order a sample so you can look, feel and touch the difference in our high-quality laser-cut and embossed invitations from Weddingstar.